The “banana cake” story is a legend at Northwestern Medicine Central DuPage Hospital (Illinois), and is often told as an inspiring tale as a way to build a memorable health care culture. It goes something like this: A cancer patient had taken a turn for the worse. One Friday as her husband was by her side, she had one request: banana cake. The man searched the hospital high and low but could not find it anywhere. Distraught, he vented to the environmental services technician who was responsible for cleaning their hospital room when he saw her in the cafeteria that afternoon. As she listened to his story, it gave her an idea. The following Monday, the technician approached the man with a banana cake she had made at home over the weekend, so he could give it to his wife. He was touched. Over the next few days, the woman’s condition got better. This seemed a miraculous recovery, given that her clinical team thought she might pass away. To this day, the husband believes that the banana cake the technician made for them saved his wife’s life. Though it’s more likely that the excellent clinical care she received is the reason for her turnaround, this tale is a reminder that if the right culture exists in a hospital setting, everyone—from the physicians to the hospital service teams—can make a lasting impact on the health care experience. Hospital service teams, such as environmental services, facilities/engineering, nutrition and food services, supply chain management, clinical engineering, patient transport, and so on, work quietly in the background to keep a hospital running smoothly. But, the work they do couldn’t be more important. To put this into context in another way, consider for a moment the impact that The Great Garbage Strike of 1968 had on New York City neighborhoods when 100,000 tons of garbage accumulated in just 10 days. Just like sanitation workers often go unnoticed in the day-to-day hustle and bustle of the city, hospital service teams do, too—until the gravity of how important their job is comes front and center, as in the garbage strike in 1968 or in the banana cake story I shared earlier. Like a city, the hospital is an incredible ecosystem that contains a hierarchy of hospital staff from world-renowned surgeons to environmental service technicians. Unfortunately, little attention is paid to hospital support teams except when hospitals are looking to cut costs. However, recognizing that these workers serve as the foundation of the hospital, and building a culture of respect around them can help create a more memorable heath care experience. This is especially important as some health care systems shift from a fee-for-service model to a value-based model (also known as pay for performance) where health care providers receive financial incentives for meeting performance measures, largely driven by Medicare. In this model, the pressure on hospital operations and hospital departments to not only provide quality health care, but also do so cost-effectively is pervasive. Efficient operations require high-performing teams, and high-performing teams must have a strong foundation. Hospital service teams are foundational to high-performance teams, and there is a need to invest in them. Here’s how. Building a strong team around a memorable culture takes investment. What are some of the ways to accomplish this? Define what the culture means to you. Whether it’s healthy relationships, pride in work, consumer-focused, define what your great culture will consist of, and then build that into every team, from the support staff all they way up the ladder. One example is Sharp HealthCare’s commitment to culture, as defined here. Make storytelling a way of life. Storytelling is one way civilizations have passed on their culture throughout history. Finding and telling those “banana cake” stories at your hospital helps reinforce and inspire the culture you’re trying to create over time. The power of storytelling to create culture is something that spans industries. Those with compelling stories are remembered more than those without. Find the stories. Privately ask employees to share their most memorable experiences interacting with a patient or others in the hospital. You could also create a way for people to quickly and easily submit stories on others’ behalf – such as things they’ve witnessed another person doing. Tell the stories. With employees’ permission, highlight a story at each monthly team meeting. This helps regularly inspire others on the team. 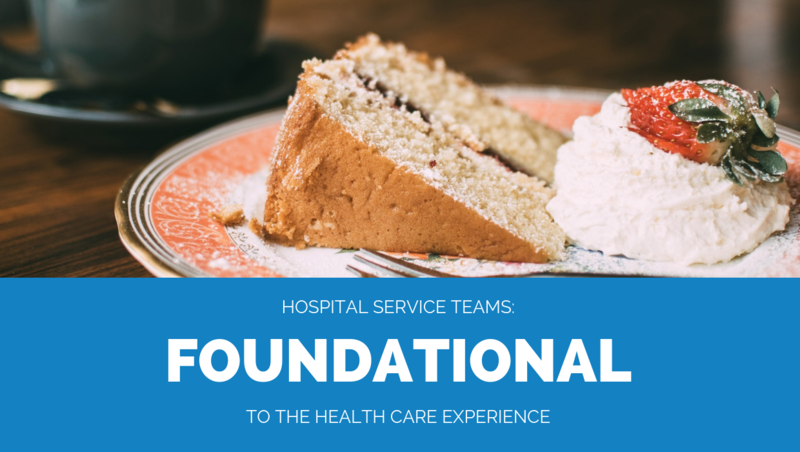 You might even have these stories told in other team meetings up the hierarchy, so that they begin to see just how important support staff can be in creating an excellent health care experience. Teach the culture. Pick a few of the most impactful stories as part of each department’s employee orientation. That way new employees hear stories reflecting the culture they should aspire to. Hospital service teams are foundational to a health system’s success. They can contribute to efficient hospital operations because happy employees mean more productive employees (this study says up to 20 percent more efficient, in fact). Creating a culture of respect around these service teams is possible—and essential in a pay-for-performance model of care. It starts with service departments built on healthy, respectful relationships and positive, consumer-focused behaviors, and grows bigger as those stories are told throughout the hospital departments and out in the public. What will your “banana cake” story be?